Please do not reproduce or redistribute any information found in TheHistoricFoodie’s blog without written permission. Thank you. A potted ham and chicken crock, late 19th century. The subject of food history is a massive one. It encompasses the planting, growing, harvesting, preservation, and cooking of countless fruits and vegetables; the raising of barnyard fowl, pigs, cattle, sheep, goats, etc. ; and the harvesting of wild game, game-birds, fish, and shellfish, all of which were, because of one factor or another, also somewhat seasonal. The wise housewife and helpmate dried, pickled, potted, smoked, cured, brined, or otherwise preserved those for the lean times. This treatise will deal with a little known method of preservation which was once of primary importance – potting. It involves sealing a food, usually some type of meat, although cheese was also potted, in butter or other fat to eliminate exposure to air which would cause it to go bad. 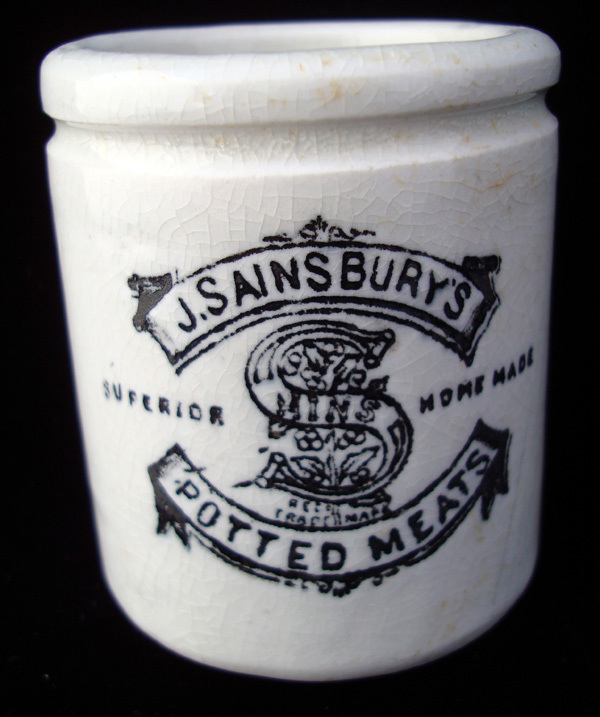 Potted meats were kept for weeks or months, providing there was a relatively cool place in which to store them. Storage facilities might have been a root cellar, a spring house, or any location that would remain cooler than the temperature inside the home. A potted meat crock, late 19th century. A more familiar term for a similar process may be confit. Confit is a French term for preserving food, usually meat, in fat. The fat may be duck fat or in the absence of sufficient quantity or in the case of pork confit it may be bacon fat. The most common types are duck, goose, and pork. If properly done, the meat will keep well for three to five months in the refrigerator, perhaps longer. Liver pate’ is also covered in butter to protect it from the air. Pots were beginning to replace the heavy paste crusts, also known as cofyns”, by the 1600’s. The heavy pastes of former years were meant to be containers to encase the fillings and protect them while sealing out air that hastened spoilage, and were not always meant to be consumed. Documenting this method is relatively easy through the 18th and 19th centuries because enough cookery books have survived to give a valuable insight into this and other preservation methods. With a little more diligent search, one can find plenteous mention of these methods many centuries earlier. Some do use to parboil their Fowl, after they have taken out the garbage, and then do dip them in Barrowsgreace [lard], or clarified butter, till they have gotten a new garment over them, and then they lay them one by one in stone pots, filling the stone pots up to the brim with Barrowsgreace or clarified butter. – Sir Hugh Plat, 1607. Sir Hugh’s account describes potted fowl as it was prepared in the sixteenth century. Sir Kenelm Digby’s book published in 1669 contained five receipts for potted meat. His account instructs in the use of pots as opposed to preparing the mixture in heavy paste which was the rule earlier and which was still an option in some books. No matter what type of meat was being potted, the method was the same. The meat was cut into pieces, baked with a quantity of fresh butter or other fat (usually with spices and seasonings), pounded with mortar and pestle (or ground), packed into earthenware pots, heated, cooled, and then sealed with a layer of clarified butter. The exception was small birds which were sometimes potted whole. Very little water was used in cooking the meats and they were baked at high temperatures to kill any organisms that could cause spoilage, or at least capture them underneath the layer of hard fat where they were not exposed to the air. The layer of fat also prevented the entry of airborne contaminants that could cause spoilage. Many early receipts specify using fresh butter because if the butter was on its way to going bad prior to being used to seal the pots of meat or cheese, the quality of the ingredients was affected and their shelf life was much shorter. A few receipts can be found for potting previously boiled meats after removing all the skin, muscle, and other unappetizing bits. Prior to covering with butter the meat was re-seasoned and packed into pots in the usual manner. Many cooks, after putting the meat-paste into pots, place the latter for a few minutes in a hot oven, for the purpose of condensing the meat as much as possible, and thereby exuding the air. – Hill, Georgiana. The Breakfast Book. 1865. London. Receipts from the 18th century involve potting beef, venison, ox-cheek, tongue, rabbit, ham, veal, chicken, salmon, mackerel, trout, eels, pike, smelts, pigeons, lamprey, char, moor-game, hare, oysters, ducks, herrings, and a variety of small birds. Game birds which were routinely potted included woodcocks, partridges, ortolains, grouse, quails, etc. To pot the birds, they were plucked, singed, and drawn before being seasoned and baked with a quantity of butter after which the meat was packed into a pot, covered with clarified butter, and tied down with heavy paper, a skin, or bladder. One source instructed that the heads of moor-game* should not be concealed underneath the butter, and that the pinions and feet of pigeons and partridges should be removed before covering the birds with butter. To pot a hare, it was cut up, placed in a deep dish with the liver and plenty of fresh butter, tied down with heavy oiled paper, and baked until tender. It was then drained, and when cold, the meat was picked from the bones, skin, and sinew. The meat was pounded in a mortar to a paste along with a little of the cooking liquid and packed into pots, pressed well down, covered with clarified fresh butter, and the pots tied down tight. The best parts of older, therefore tougher, rabbits, usually haunches and loins were treated similarly. For young tender rabbits, they were larded with bacon fat, ham, or tongue, seasoned with salt, pepper, and nutmeg, and either potted in the traditional manner, or the meat made into rolls, tied to secure them, and then packed with herbs, spices, and garlic. They were covered with clarified butter or olive oil, and when using the latter were said to, “keep well for a length of time”. – Hill, Georgiana. The Breakfast Book. 1865. London. Tongues were boiled until tender with wine and spices then the tough outer covering peeled off and discarded. The remaining meat was cut up, pounded with spices (usually salt, pepper, nutmeg, and mace), and finished off as usual. Potting was of such value in preserving food, that Sarah Harrison included 16 distinct receipts in her book published in 1739. A cook with the ability to think for herself, was able to use those methods as a guide for putting away any number of meats or combinations of meats. – The Housekeeper’s Pocket-Book. A thorough perusal of primary sources indicates that early cooks often kept a potted meat past its prime yet refused to waste it. Such was evidenced by Hannah Glasses’ instructions (1777 and 1787). This is not surprising in a time when cookbooks usually contained instructions for freshening meat that had been kept too long in a non-preserved state. Glasse said, “I have seen potted birds that have come a great way, often smell so bad, that nobody could bear the smell of the rankness of the butter”. Her method of remedying the problem was to take all the birds, or pieces of birds, out of the pot, dip them for half a minute into a pot of boiling water to remove the butter, dry them, return them to the pot, and again pour fresh clarified butter over them to seal out the air. While few of us would want to go that far with the process, potted meat and cheese are excellent tidbits which need only crusty bread to make a meal which was considered quite pleasing in former times. Inns that took pride in the service they provided weary travelers kept potted meats, fish, and cheeses on hand so that a good quality tasty meal was always at hand when a hungry patron arrived, and ships captains stocked potted foods to be consumed on long sea voyages. 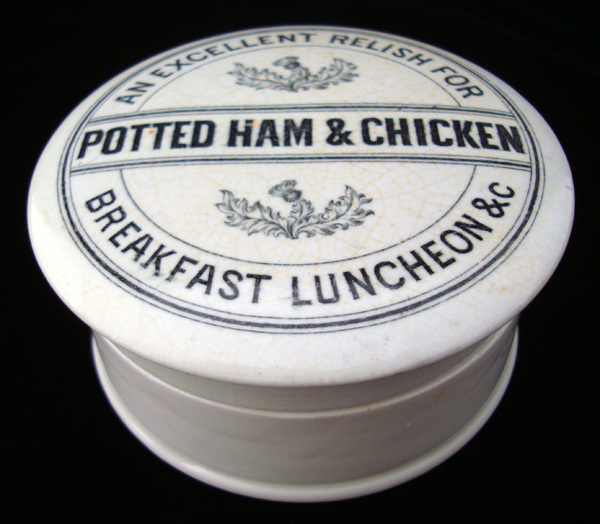 Potted meats were put up in pots that held a pint, a quart, or sometimes two quarts. Some receipts instruct putting it up in a firkin which was a wooden vessel or tub used to hold butter or lard. – Table Talk. No. 3. March 1888. Potted meat obviously wasn’t always the nasty canned product sold by that name today made from meat by-products and mechanically separated chicken. Meat by-products are everything but the hair, horns, and hooves and mechanically separated chicken refers to a paste made by forcing chicken through a sieve to separate the bones from the tissue, obviously wasting nothing. Quite the contrary in former times, when better cuts of meat were used for potting so that when the product was served it was tasty and nutritious and could as easily be featured on the tea table as on the dinner table. Hill, Georgiana. The Breakfast Book. 1865. London. Webster, Thomas & Parkes, Mrs. The American Family Encyclopedia of Useful Knowledge. 1856. Lee, N.M.K. The Cook’s Own Book. 1832 and 1840. Boston. Mason, Charlotte. The Ladies’ Assistant. 1777 and 1787. London. Harrison, Sarah. The Housekeeper’s Pocket-Book. 1739. London. Carter, Charles. The London and Country Cook. 1749. London. Young, Arthur. A Six-Months Tour Through the North of England. 1770. London. Glasse, Hannah. The Art of Cookery Made Plain and Easy. 1774 and 1788. London.